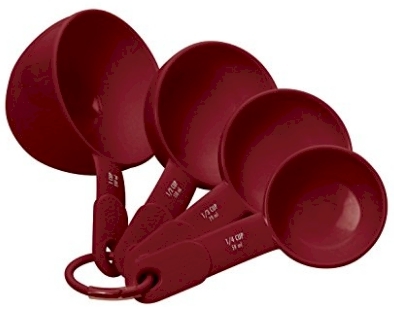 Amazon has got this set of 4 KitchenAid measuring cups in red for $3.32. This set got 4.6 out of 5 stars over 139 customer reviews. 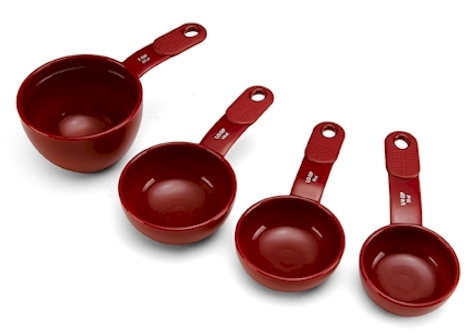 Each set includes 4 different size measuring cups: 1/4, 1/3, 1/2 and 1-cup. The measuring cups are constructed of durable, dishwasher-safe plastic. The cups work with both wet and dry ingredients. Each measuring cup nests in the next larger one, with an integrated loop in the handles for hanging storage. Each cup has its size printed in easy to read letters on its handle.